The kid shows it to his science teacher at the beginning of the day. The teacher suggests that he put it away and show it to no one else. In spite of this, he shows all of his teachers who say nothing, until later in the day when a teacher becomes concerned because this clock-like device begins to ring. And, on further examination, the teacher determines it looks like it could be a bomb. When the kid is questioned he becomes passive aggressive and offers no reason for his actions. Coincidentally, it's the day after the anniversary of 9/11 and his name is Ahmed Mohamed. He also happens to be a Muslim. When questioned further by the police he still says nothing, offers no defense, no motive, so he's detained, even handcuffed. His father, in response, calls the radical Muslim group CAIR, which is widely acknowledged as a radical front-group that supports Jihad around the world. The media, in turn, has a field day with the kids arrest, painting Americans in broad-strokes as racist, anti-Muslim bigots. This they do with very few facts, but much surmise. The president, likewise, sings the kids praises for being so smart as to be able to build a clock. But, even that turns out to be untrue, since the kid apparently simply took an 80's vintage clock out of its casing and put it into a security briefcase with a lock on it, wrapped in a cable. Oh, and one more thing, his sister made a bomb threat against her school three years earlier. The father appears to have other questionable affiliations, as well. Is any of this a red flag? No, it is a sea of red flags, invisible only to the mainstream media, the far Left and the president. If ever there was a reason to question the world-view of the far Left in the U.S., this would be a good place to start. As radical Muslims numbering in the hundreds of millions support or engage in torture and slaughter around much of the world, it is the values of average Americans that are called into question as the media openly castigates our culture, our way of life and our values. The murderous radicals, by comparison, are portrayed as victims of American hegemony, just in need of some gainful employment and a little love, as an Obama administration official had publicly suggested about ISIS a few months back. 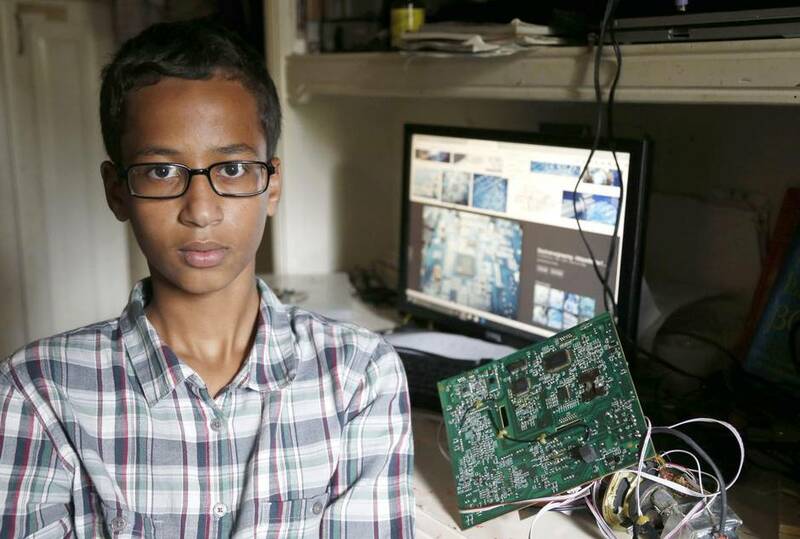 The strange case of Ahmed Mohamed, then, is a microcosm of a much larger debate between the Left and Right in this country and beyond. So, the way the story get's told matters—for both the future of the U.S., and the rest of the world. Don't let them get away with it.